A member of the El Libertario editorial collective prepared this article for the 6th edition of the Costa Rican anarchist journal La Libertad in response to an inconsistent effort to establish impossible affinities between Chavismo and anarchism. 1) One of the successes of the inter-bourgeois confrontation that has been happening in Venezuela for almost a decade is the moving of the media polarization into an international space. This biased and infantilized point of view could well confuse some less awakened libertarian spirits. This indeed seems to be the case with the opinions voiced by companero Rogelio Cedeno in his text ‘Venezuela today: Realities and half truths’, published in # 5 of the Costa Rican journal La Libertad. Cedeno in a turnabout of intellectual prestidigitation asks for the social situation in Costa Rica precisely what he denies for that of Venezuela: a non-problematic and non-Manichean point of view. While, on the one hand, the Costa Rican movement opposed to the Free Trade Agreement is “…a wholly plural movement that breaks with the simplistic schema based upon the existence of a presumed polarization between left and right”, on the other hand, in Venezuela, the forces that are not aligned with the government represent, “…the brutal violence and cynicism of the forces of reaction”, that desperately yearn for a return to the days of the adeco-copeyan democracy. A strange business this…barely a paragraph earlier Cedeno had affirmed that, “visions in black and white are of little use to those of us who keep on thinking and struggling for a better world.” This very same horizon is shared by a constellation of revolutionary left-wing groups who, despite being made invisible by the propaganda of both the private sector and the state, reject the past as much as they do the present and continue, against the current, to struggle for a better future. 2) Cedeno reproduces the logic and history manufactured by the government in Caracas. Repeating the mythologizing excesses of Chavism, he locates the genesis of, “…the political and social dynamics of the end of the century,” and the, “…emergence of a revolutionary situation,” in Venezuela, in the attempts at a military coup led by Chavez himself in 1992. A simple glance at Venezuelan history would, as many diverse studies ratify, place the foundational stone of the current situation in the mid 80’s when, as a consequence of the economic crisis, a series of social movements catalyzed the discontent of the average citizen which in turn led to a brutal explosion during the occurrences of the ‘Caracazo’. During that February of 1989 a wave of popular protest reacted to the imposition of a package of neoliberal reforms. This social fabric expanded through various different dynamics, formally founding the first human rights organisations, networks of ecologists and women, student and neighbourhood associations, through employment conflicts and countercultural niches. This subjectivity and will for change is what Chavez capitalized on for his electoral victory. Venezuela thus confirms the words of Cornelius Castoriadis: Popular revolts in the Third World are always channelled and recuperated by a new bureaucracy. 3) Venezuelan anarchists reject the coup d’etat that occurred in April 2002, as we also repudiate those that happened ten years earlier. Similarly we have denounced the distortion and manipulation of the facts. This is a long and complex history, but here we will only refute the elements repeated by Cedeno. If it is indeed true that the president counted on a certain mobilization in his favour on the 11th April 2002, then quantitatively the demonstration against him was considerably larger. On the other hand, those that died belonged to both sides, not exclusively to the Chavez side as has been suggested- and the formation of a ‘Truth commission’, which would have examined the events in an impartial manner, was boycotted with the same impetus by members of the government and by the opposition. If the demonstrations of the 13th April and the morning of the 14th really were significant, they in no way “…stopped fascism”, nor “…contained the forces of reaction.” The coup against Chavez and his later return was negotiated across desktops by military officials, without a single mediative shot being fired between soldiers. The evidence is considerable, but due to lack of space we will present just one piece: no soldier was tried for their participation in the events. Let us concentrate on this issue, for the propaganda that surrounds social politics in Venezuela confuses local people much less than it does foreigners. Our country is experiencing one of its most significant economic booms of the last thirty years as a result of high oil prices. However, considering the wealth of resources available, the social policies that have been implemented, almost exclusively through the ‘missions’, are superficial and ineffective. It is not just we, the anarchists, who are pointing this out; this has been affirmed by NGO’s that monitor the human rights situation in the country. While we at the bottom receive the scraps from the feast of black gold, a new bureaucracy- nicknamed the ‘boliburguesía’ (contraction of Bolivarian + bourgeoisie) - has appeared reinforcing the role that economic globalization has assigned to us: that of providing energy in a ‘secure and trustworthy way’ to the international marketplace. Leaving aside questions about the social and environmental consequences of this type of development, the President recently summed up in a phrase the project of the red elite in power: petro-socialism. 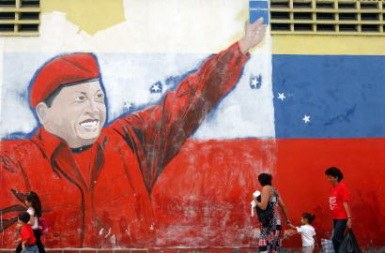 5) Independent of the restructuring of the State, the return of governability and the ‘democratic’ opening in Venezuela – all seriously damaged during the rioting of the Caracazo of 1989, and a bad example for other countries in the region -, is it possible to suggest that the Chavez phenomenon strengthens democratic and self-determining organisational processes? The National Executive has repeatedly imposed from above different and successive organisational models that have mortgaged the autonomy of the Chavista bases, eclipsing local leadership structures, electoralizing agendas and dynamics and imposing militarizing logic and a single party. ‘Participation’ is possible as long as its innocuous, ‘protaganism’ non-existant. There are interesting initiatives that exist in the grass roots structures of the Chavez project, but there exceptionality confirms the rule: In any given field, any initiatives are the exclusive property of the head of state. Examples abound, like the constitutional reform that is currently being discussed in absolute secrecy, or extraordinary powers such as the Ley Habilitante, which gives the president the ability to pass laws by decree. We shall refer to one of the lesser known examples. As a result of a mandate from above, Conarepol, a plural commission was charged with designing a new policing model for the country. To that end they conducted 70,000 consultations with different actors over the length and breadth of the country, including those communities affected by uniformed violence. The entire Conarepol projected was basketed over a single phrase, “…it’s a right-wing project”, and now a centralisation of the police forces has been decided through the Ley Habilitante. In this part of the Caribbean we don’t suffer ‘deja vú’ for the CNT-FAI of 1936 nor do we allow ourselves to be confused by the re-semantization of demagoguery. Last year 402 prisoners, coming from the popular classes, died violently in the prisons of the ‘Bolivarian Revolution’. More than 60 leaders of trade union and neighbourhood groups were in court because of their participation in strikes, blockades and demonstrations to demand their rights. As Bakunin said, the people will not feel better to see that the club with which they’re beaten with bears their own name. We, the libertarian creoles, have assumed the attitudes of any consistent anarchist: to confront power and stand side by side with the oppressed, gathering together means and ends, constructing free spaces and refusing to be either victim or tyrant. We leave the ‘tactical alliances’ and ‘critical support’, the smokescreens and mirrors to the politicians, of whom there are so many in Venezuela today, fattening their egos and bank accounts, hallucinating a 21st Century socialism that is both military and imperialist by nature, with its epicentre in Caracas.